Ewha is recruiting international students to join the degree-seeking program at the university. Various scholarship opportunities including full tuition fee, and on-campus dormitory fee are aviable. Ewha provides vast fields of studies including 69 majors in 12 colleges. Majors English Language and Literature, Business, Economics, Korean Language and Literature, Communications (Journalism, Advertising & PR, and Film majors), Arts & Design, etc. Started from 1971, Ewha International Co-ed Summer College (EISC) is the oldest international co-ed summer program in Korea. For Ewha students, the program will provide opportunities to take world-class education taught by high-quality professors from renowned universities. Foreign students will be given, a chance to research Korea’s history and culture. This year, professors from Yale, Cornell, University of California, State University of New York, and Indiana University will be joining for the EISC program to teach classes. 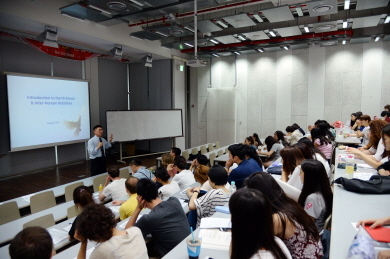 In addition, students can take EISC classes with only paying the Ewha’s summer session tuition fee. Other than the academic experience, students will have a chance to build a global network and cultivate global competence with foreign students. Project Bridge is one of the community outreach programs run by “The Korea Society” to improve cooperation and understanding between Korea and America. The Project Bridge Study Tour will be held as a field trip for American high school students appointed as Project Bridge Youth Ambassador on April 10, from 9 a.m. to 1 p.m. During the field trip in Korea, students will visit Ewha to take Korean Studies lecture and to have cultural exchange moments with Ewha students. Send an e-mail (oia@ewha.ac.kr) for further information.